Baseball – watching the Giants win! We are holding our mid year sales meeting this week and I have brought our sales team in together for training and territory planning. And since it’s beautiful weather, and it’s summer, we went as a company to AT&T Park to watch the Giants play the Cincinnati Reds. The team all really enjoyed the game – especially since our home team crushed the opposition! 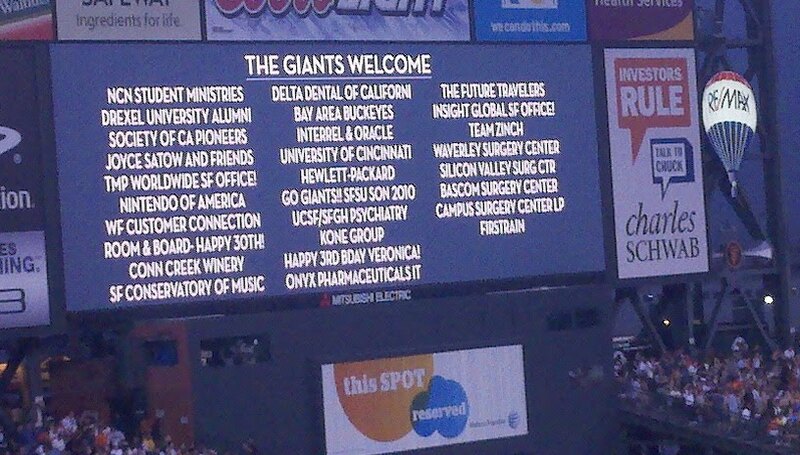 And because we had purchased a block of tickets our name was listed on the big board. There is just no part of the current economy that is about getting lucky – and sales people know this more than anyone. CSO Insights run a sales performance study and are (not surprisingly) picking up the significant drop-off in sales performance over the last year. They find one of the keys to success is account-focused intelligence – here’s their analysis. and “it’s critical that the salesperson is able to quickly collect the information required to go beyond having a product conversation to having a meaningful dialogue about the customer’s business”. So no surprise – sales reps that are willing to do the work get better results – and those that succeed understand the impact of a) doing thorough research on a prospect account then b) integrating that knowledge into a strategic account plan. CSO Insights segmented their 2010 survey based on firms that exceeded expectations, met expectations and needs improvement based on these two aspects of selling and as you would expect – those that do strategic research and use it in their account plans do better!